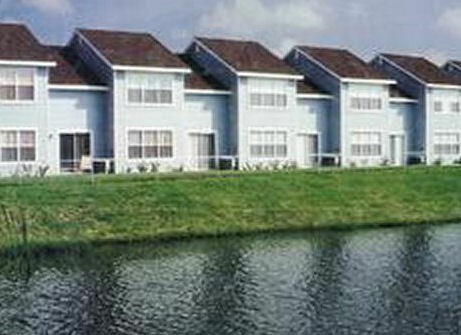 Villas at Fortune Place in Kissimmee, Florida Near DISNEY - Buy a 7 Night Stay in a 2 or 3 Bedroom Suite! 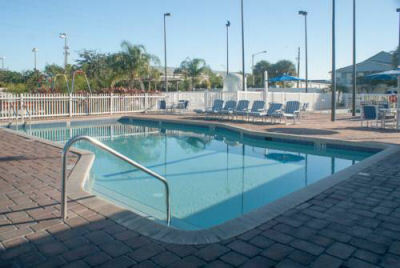 Enjoy a 7 Night Stay in a 2 or 3 Bedroom Suite at the Villas at Fortune Place in Kissimmee, Florida! 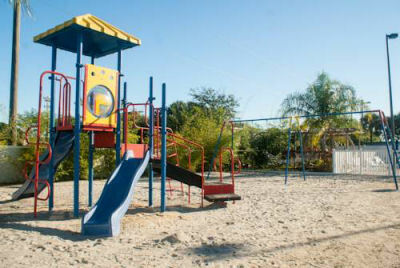 Villas at Fortune Place is an excellent resort complex providing fun for the whole family. Everyone can enjoy the swimming pools, tennis courts, shuffleboard, basketball and horseshoe courts and lake. Kids will love the children's pool, playground, and mushroom-shaped pool fountain. Relax in the whirlpool/hot tub and take a break at the on-site gym. 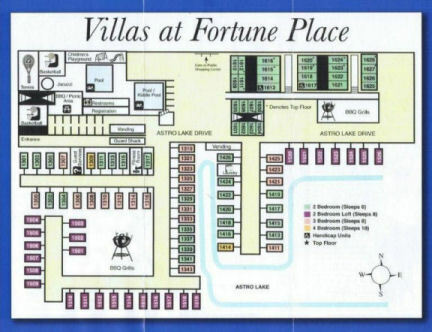 Every member of the family will enjoy a relaxing vacation at the Villas at Fortune Place. 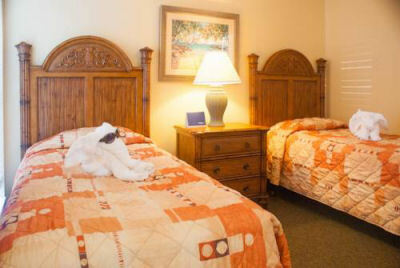 The resort offers the best of both worlds-located 15 miles from Walt Disney's famous attractions, yet a quiet getaway with all the comforts of home. 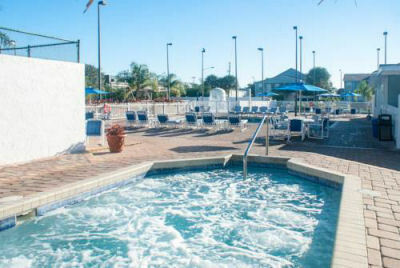 After a busy day at Walt Disney World(R), Sea World, or Universal Studios, unwind in the recreation area, featuring an outdoor pool and Jacuzzi, while the kids can keep active on the playground. Shopping and dining areas are a short distance away. Beautiful Lake Tohopekaliga is close by for fishing, boating, and other water sports. television, washer/dryer and a full kitchen. 2BR units Max 6/Pri 6 have 2 or 2.5 baths, 1 queen bed, 1 double bed or 2 twin beds and 1 sleep sofa. 2BR units Max 8/Pri 6 with loft have 2 baths, 2 queen pull-out sofas, 1 queen bed and 2 twin beds. 3BR units Max 8/Pri 8 have either 2, 2.5 or 3 baths, 1 queen bed, 1 double bed, 2 twin beds and 1 sleep sofa. 4BR units Max 10/Pri 10 have either 3 baths, 1 queen bed, 1 double bed, 4 twin beds and 1 sleep sofa. 2 Bedroom Unit: Sleeps up to 6 or 8 guests and comes with a full kitchen. 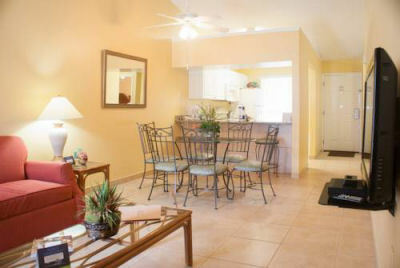 OR UPGRADE TO A 3 BEDROOM SUITE FOR $125 FOR THE ENTIRE WEEK! 3 Bedroom Unit: Sleeps up to 8 guests and comes with a full kitchen. No pets allowed. A car is recommended to fully enjoy the area. This resort is a non-smoking facility. Security deposit is 100 U.S. dollars. Resort amenities fee is 25.00 U.S. dollars for the entire week. This fee is additional and is collected be the resort at check-in. It includes WI-FI, gas grills, amenities equipment, etc.